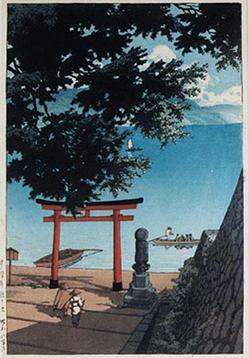 Hasui Kawase; Woodcut, Lakeside Temple Gate, 13 inch. A oban tate-e (the most common Japanese wood-block print by Hasui Kawase (Japanese, 1883 to 1957). Depicting a lakeside temple gate; framed.